The dragon of folklore means the powers of chaos and waste. The parable of “a certain young man went down from Jerusalem to Jericho” means he went down from the unfallen state to the fallen state because Rahab lives at Jericho. Leviathan or Rahab means tyranny in some form. The hero is fighting for liberty against tyranny. It sounds phony, but it is something like that. The activity of Jesus becomes the true form of the hero’s act; casting out devils equals the killing of the enemy of man. I am against thee, Pharaoh, King of Egypt, the great dragon that lieth in the midst of his rivers, which hath said, my river is mine own and I have made it for myself. But I have put hooks into thy jaws and I will cause the fish of thy rivers to stick unto thy scales and I will bring thee out of the midst of they rivers and all the fish of thy rivers shall stick unto thy scales. Thou did not divide the sea by thy strength; thou brakest the heads of the dragon in the waters. 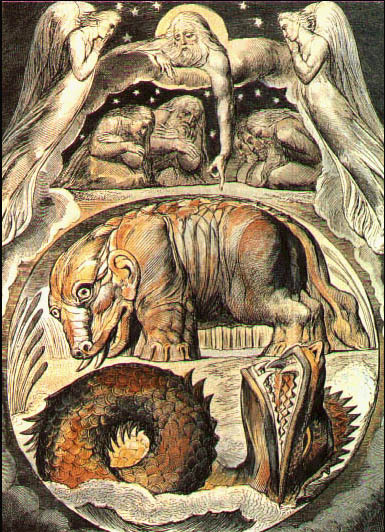 In that day the Lord with his sore and great and strong sword shall punish leviathan the piercing serpent; even leviathan that crooked serpent; and he shall slay the dragon that is in the sea. In the Gospels, leviathan is the sea monster; but God can control the sea. The hauling of leviathan out of the sea is important to the fishing symbolism in the Gospel. Jesus is the fisher or men. The fish are not in the sea by accident. Leviathan is the sea. When he is drawn out, the sea no longer exists, only rivers circulating freely.